We’re writing to let you know that MISN will be going on a hiatus from external organizing for a little while. Everything is okay, there’s nothing wrong! We’ve just experienced some shifts in the membership of our core collective recently that has been making our capacity feel a little lower than usual. 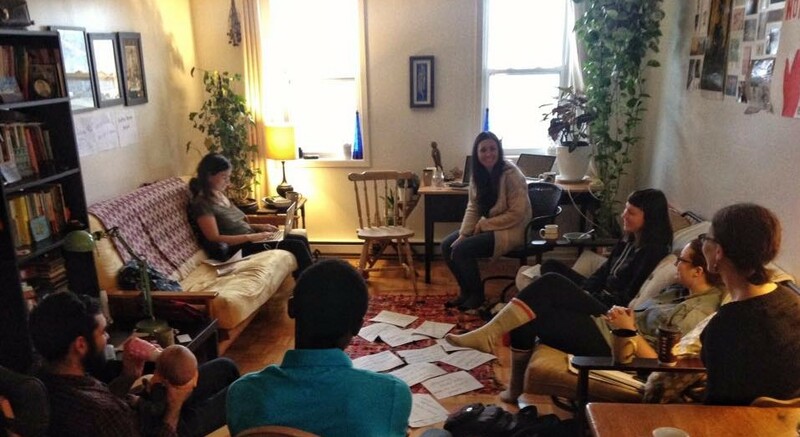 We will still be busy over the next couple of months… but as an act of care to ourselves and in service of long-term sustainable organizing, we will be focusing our energy on developing new models for investing in new mining justice activists, recruiting and onboarding new core collective members, and generally building our power and capacity. We think this is a very good and exciting thing! #1: We’re not going to be around that much this fall or available to support the global mining justice movement/Toronto-based organizing as much as usual. We won’t be planning any actions/events, taking on new relationships with mining-impacted communities, or agreeing to many requests to speak/present/educate/table/co-host/etc. But we haven’t gone away! We’re just focusing inwardly right now. #2: We want to model the fact that taking breaks is okay. Resting is okay! Saying “I’m tired” is okay. We’re in this for the long haul, folks, and we want you to be too. Capitalism and colonialism aren’t going to abolish themselves, and so we need our collective strength, which can only be maintained through mutual aid, solidarity, friendship, rest, perspective, and whatever else nourishes our spirits. To anybody who’s been thinking of joining MISN for a while: now is a REALLY good time to get in touch with us about that. We will be holding a new member’s orientation later in the fall, but please email us about this anytime, especially if you are an experienced organizer. We are a small but mighty feminist-minded, anti-capitalist, anti-colonial collective that strongly values thoughtfulness, creativity, humour, and liking the people we organize with. We’d love to have you join us as we work to build our numbers, energy, and capacity! See you in January 2018, friends! p.s. And to you, if you work for the mining industry and are reading this: do not interpret this as a sign of weakness. We will be back soon… bigger, better, bolder, and more ready than ever to f*ck you up. Get ready. 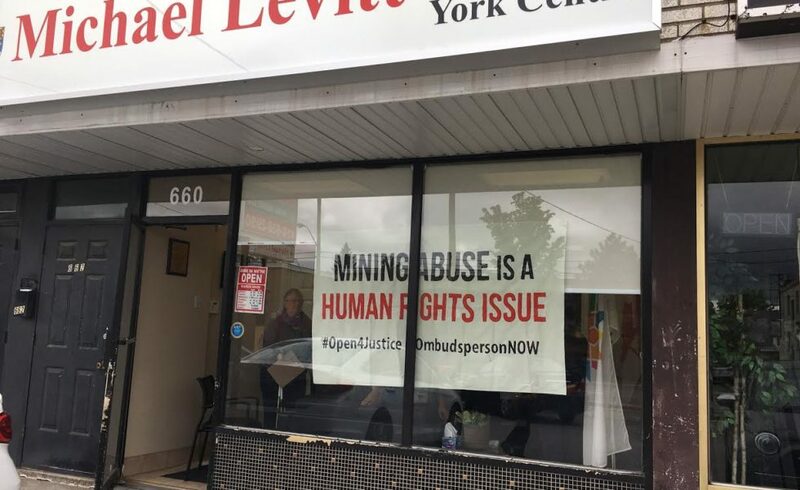 As the United Nations Working Group on Business and Human Rights begins its country visit of Canada, Human rights activists staged a sit-in today at the North York constituency office of MP Michael Levitt, chair of the Subcommittee on International Human Rights. The sit-in participants held a banner exclaiming that “mining abuse is a human rights issue”, taking aim at comments from members of the subcommittee, including Levitt, that the harm caused overseas mining was a trade issue, not a human rights one. Activists also delivered 25 reports numbering over 1000 pages – authored by numerous NGOs as well as several committees within the United Nations and the InterAmerican Commission on Human Rights – detailing the connection between the global mining industry and systemic human rights abuse. They asserted that Levitt should be a leader in the charge to create a human rights ombudsperson for the extractive sector, not a detractor. Levitt was targeted for this action because his office has been particularly dismissive of human rights violations at Canadian mine sites overseas. In two previous meetings, including one with a Filipino delegation with Subanen and Lumad Indigenous leaders, Levitt failed to address their concerns and instead insisted that they should bring their complaints elsewhere. This isn’t clickbait. This is real life. This is the Canadian mining industry. 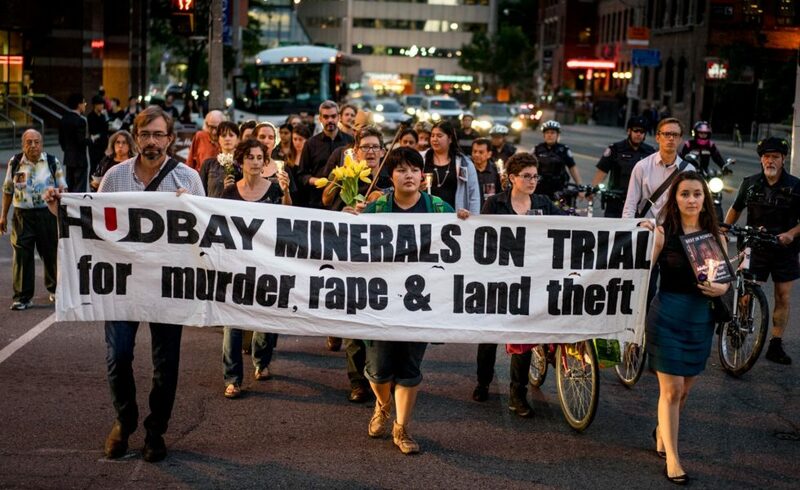 Last week two friends of MISN were arrested in Peru after showing a documentary exposing Hudbay Minerals’ track record of human rights and environmental abuses. Stop by this Canadian mining company’s annual general meeting to watch the film that they didn’t want Peruvians to see! 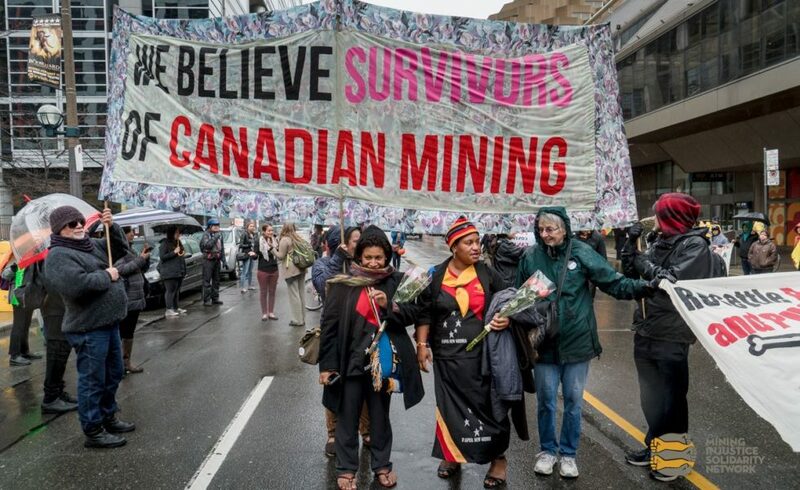 Barrick’s Annual General Meeting this year focused on survivor-led organizing in Papua New Guinea, as we were honoured to have the presence of two survivor-advocates against sexual violence in Porgera with us in Toronto this year. 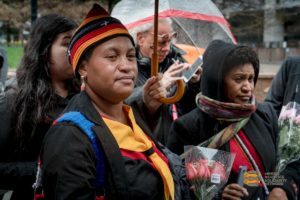 While Everlyn Gaupe and Joycelyn Mandi were inside to testify, about 50 people rallied in the cold and rain so that when they came out, they would be greeted by supporters. Inside the meeting, Everlyn and Joycelyn were denied speaking rights, despite having legal proxies. Catherine Coumans, from MiningWatch Canada, instead read their statements aloud while the women stood beside her. Klaire Gain and Dan Hammond were able to speak to issues at Barrick’s Pueblo Viejo mine within Barrick’s meeting, including a hilarious exchange from the floor of the audience with Barrick President Kelvin Dushnisky. The interventions were mentioned in mainstream media and Everlyn and Joycelyn’s visit has been the subject of several in-depth pieces. The women are still in North America where they are meeting with allies and supporters. MISN is organizing a smartphone and camera drive for the women, so that they can take these documentation tools home with them to distribute amongst the women in the communities surrounding Barrick’s Porgera mine. Please get in touch if you have a phone or camera to send with them! This hour-long interview with Everyln and Joycelyn from #WeAreUofT on CIUT fm. Ellie Adekur from Silence is Violence (UofT) interviews the women as they open up about their experiences with the company. Listen here. 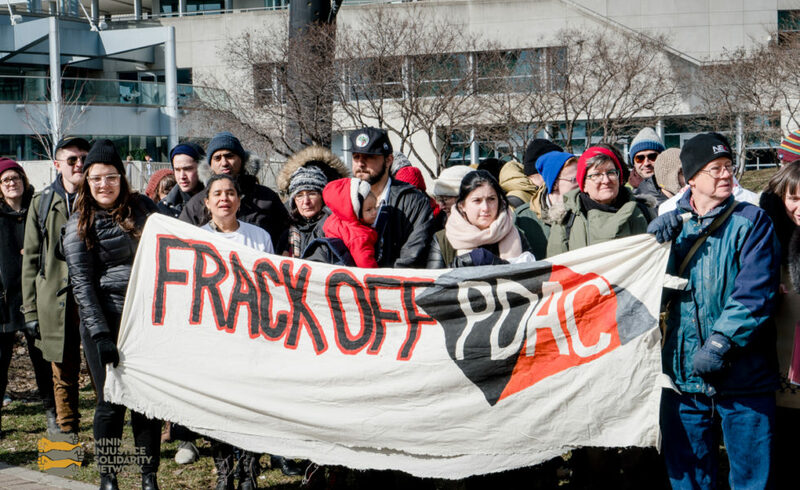 Everlyn also appeared on prime time CBC radio for their coverage of the Peoples Climate Movement march in Toronto, and a piece is due out on the BBC!